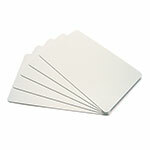 13.56MHz high-frequency cards, in standard smartcard sized formfactor. NXP has developed the MIFARE MF1ICS20 to be used in a contactless smart card according to ISO/IEC 14443 Type A. The MIFARE MF1ICS20 IC is used in applications like public transport ticketing where major cities have adopted MIFARE as their e-ticketing solution of choice. 320 Byte, organized in 5 sectors with 4 blocks of 16 bytes each (one block consists of 16 byte). 24-April-2019: In stock for immediate delivery! NXP has developed the MIFARE MF01CU1 to be used with proximity coupling devices according to ISO14443A, it can act as single trip tickets in public transportation networks, loyalty cards or day passes for events. They are the ideal replacement for conventional ticketing solutions such as paper tickets, magnetic stripe tickets or coins. Mifare ultralight can be easily be integrated into existing schemes and even standard paper ticket vending equipment can be upgraded. In addition this solution for low cost tickets can help operators to reduce fraud and the circulation of cash within the system. 512-bit, organized in 16 pages with 4 bytes per page. TI2048 (Tag-it� HF-I Plus) compatible. 2048-Bit User Memory in 64-Bit � 32-Bit Blocks. product authentication in different industries such as pharmaceutical, medical devices and alcohol, as well as production management in different areas of the industry. This IC is the third generation of a product family of smart label ICs based on the ISO standards ISO/IEC 15693 and ISO/IEC 18000-3, prolonging a successful story of NXP in the field of vicinity identification systems. 1024 bits, organized in 32 blocks of 4 bytes each. Hybrid card containing both EM Micro EM4200 and Mifare MF1 IC S50 chips/antennas. The card can be read in both LF (125kHz) and HF (13.56MHz) readers.